UCF's rise is notable, but it's also interesting how much of this ranking remained stagnant. Look at the resumes with a fresh set of eyes each week. That’s the selection committee’s mandate. That’s what the committee claims it does every single week. Well–this week, at least–it’s pretty obvious that the committee didn’t do that, instead just adjusting their previous conclusions. Despite that, the selection committee sent a very powerful message this week in one area where it didn’t just stick with what it had last week. That message–that Ohio State has looked so bad that it fell behind UCF–is an important one. It is the first time we have seen an undefeated Group of 5 team ahead of a one-loss Power 5 team. If the committee sticks with that assessment, we are an Ohio State victory this week away from UCF having a real shot at the Playoff. The committee stuck with chalk for the entire top eight teams. Washington State possibly could have jumped LSU, as the Tigers beat up on Rice (likely the second-worst team in FBS, except for UConn). That didn’t happen, though it’s hard to see LSU keeping ahead of Washington State, Oklahoma, and UCF, if those three continue winning. As mentioned above, UCF jumped Ohio State. That was not unexpected–it happened in the major human polls as well–but it is interesting that Ohio State is getting punished for a bad defense more than Oklahoma. Rece Davis asked Rob Mullens about it, and Mullens didn’t really give an answer. He just hemmed that the selection committee felt that UCF was the better all-around team. After that, though, the committee really just went with what it had last week. West Virginia fell four spots for losing to Oklahoma State. Syracuse fell eight spots for getting blown out by Notre Dame. Iowa State dropped nine spots after losing to Texas. Boston College and Cincinnati both lost and dropped out of the rankings. Every team behind those teams just shifted up the requisite number of spots. The only flip in rankings–aside from UCF and Ohio State–was Texas A&M jumping over Boise State as the Aggies came in from being unranked last week. If the committee was really starting from scratch every week, we would see some shift in rankings. We would see Kentucky move back up, as its resume is currently underappreciated. We might see Penn State slide a little for its lackluster wins. Maybe the committee could have even flipped Washington and Utah–even though Washington won that matchup head-to-head–as the Utes currently have the stronger resume. Or Utah State could have jumped Northwestern, rectifying an error from last week. The committee didn’t have to do all of these things. Doing none of them, however, shows that the committee started based on last week’s rankings, not from scratch. I’ve pointed out the committee’s inconsistencies in the past about whether it really re-evaluates teams, or just starts from scratch. 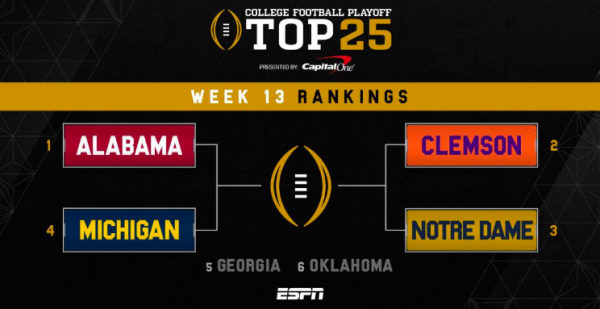 This is now the second week in a row, though, that the committee has gone with the old-fashioned “poll mentality.” The last rankings are the only ones that really matter, but this is setting a bad precedent for how this year’s committee is viewing its job.